Thomas M. Bradley, 86, passed away on Friday, June 15, 2018 at his home in North Arlington, NJ while surrounded by his loving family. The funeral will be from the Thiele-Reid Family Funeral Home, 585 Belgrove Drive, Kearny, NJ on Tuesday, June 19, 2018 at 9:00 a.m. a Funeral Mass will be offered in Queen of Peace Church, North Arlington at 10:00 a.m. Entombment will follow at Holy Cross Cemetery, North Arlington. 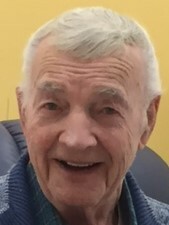 Relatives and friends are invited to visit at the funeral home on Monday from 2 to 4 and 7 to 9 p.m.
Mr. Bradley was born in Cambuslang, Scotland and immigrated to Kearny in 1950 before moving to North Arlington in 1960. While in Scotland he served in the British Army. After becoming a citizen in the United States and was drafted by the U.S. Army serving from 1953 until 1955. He was a member of The Scots American Athletic Club of Kearny and Lodge # 1992, B.P.O E. North Arlington. He is survived by his children, Rose Marie Edwards (Billy), Bernadette Santiago (Hector) and Thomas P. Bradley (Kelly) Tom was the grandfather of A.J., Nico, Donna, Michael, Will and Matt and great-grandfather of Evan, Leanne, Jaydan, Carly, Tyler, Ryan and Katie. Tom also leaves behind several nieces and nephews. He was predeceased by his wife, Bernadette (nee Mc Sherry) Bradley.